The other day I was having a conversation with members of my quilting group, and the subject of exhibiting one’s quilts came up. I was of the opinion that my quilts would never be good enough to show at a juried competition. Not out of false modesty, but actually DO believe this wholeheartedly. My quilting has always been informal, and just “for the fun of it.” I have never had any designs on winning awards, being published, or making an income out of this avocation. I just do it because I like to. True, some of my quilts have sold at certain crafts fairs and such, but I have never thought this fact indicative of some superior quality. Nice looking, perhaps; pretty, sure; nice fabrics, no doubt; interesting color combinations, likely. But competition quality? Hardly. So when the gauntlet was thrown by my cohorts the other night, that I should not sell myself short and give the competition a try, I decided I’d take the challenge. So I’ve begun working on a project to present at our next guild’s Quilt Show. 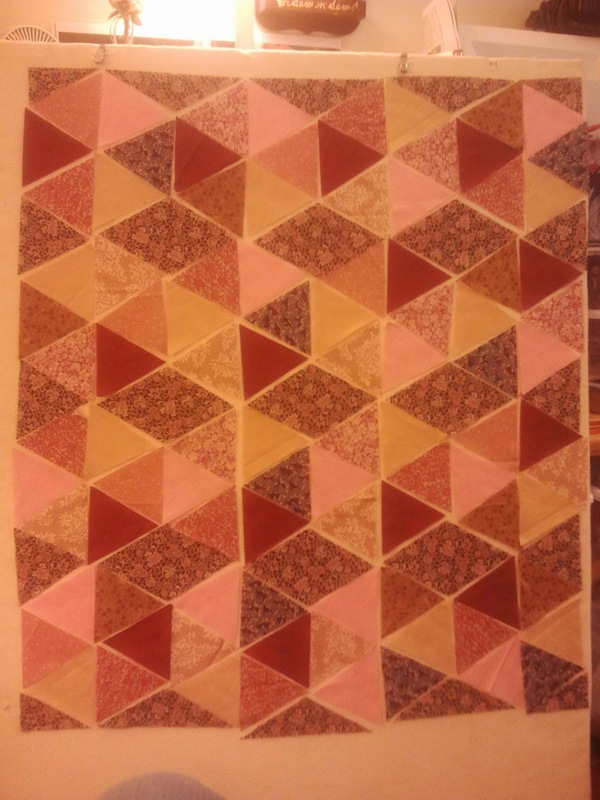 I’ve taken a design from one of my favorite books, Material Obsession, Modern Quilts with Traditional Roots by Kathy Doughty and Sarah Fielke (http://amzn.to/16aVt05), only I’ve tweaked it somewhat. So far I’ve cut all the pieces and I’m in the process of sewing them together. I’ve already run into a problem, however; I can’t quite work out the corners. Considering I’ve altered the size of the blocks, this will take some doing. But I said I’d do it, so by golly, that’s what I’ll do!